Happy Saturday!!! 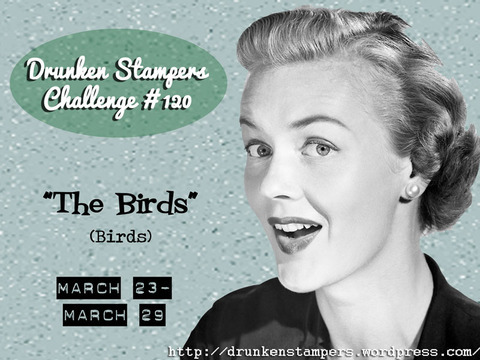 Time for another movie inspired Drunken Stampers challenge!! This week's feature presentation is....THE BIRDS!! A movie I have not and probably will not ever see...birds freak me out!!! Be sure to visit the DRUNKEN STAMPERS BLOG for all the details on this challenge and to show the Bahama Mamas some crafty love!!! Don't forget to link up your project on the blog using the InLinkz tool...who knows...maybe you'll be our next life of the party!! To give it a glossy look (not sure if you can see it in the picture) I used a few coats of clear embossing powder on top. 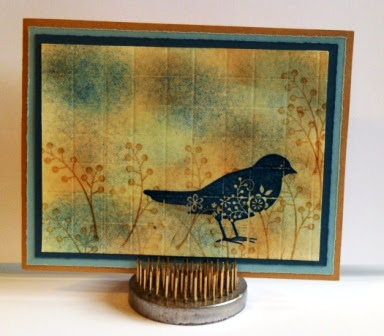 Beautiful card Donna! Love the colors you used! Love it, you did a fabulous job, I have never seen that grid technique. great colours. I am not such a bird fan myself...a friend of mine *loves* crows, and I just think...a group of them is called a 'murder'. NOT SOMETHING I see myself loving! Unlike your card, that is - love the grid technique! It adds so much texture :) Love the colours you used too!